Hi, Veganesers! It’s me, Melissa, coming back from… well, I never really left. But I haven’t been keeping up with the blog. Sadface. I have excuses — some are even valid — but this isn’t a confessional. It’s a blog about turning vegan. Can you guys believe that it’s already May? I’m glad April is over. May 2012 brought a lot of great surprises and I’m hopeful that May 2013 will be the same. What I’m most excited about is that it finally feels like spring in Chicago. Outdoor Farmers Markets! Dining al fresco! Sunshine! Fresh garden veggies on the horizon! All that said, I still spend most of my time cooped up in the office. Luckily, I have provisions. 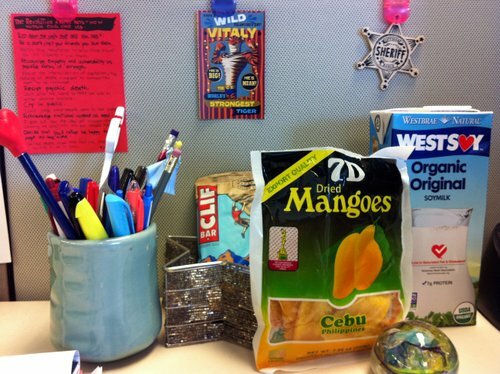 The CLIF bar that’s hiding back there is my emergency snack, in case I don’t have time to get lunch or am about to hulk out from being so hungry. The soy milk was given to me by my co-worker Joelen, who has her own food blog (it’s not vegan, but it’s wickedly awesome and she’s an awesome person so check it out). I’ll be opening it soon and using it for my morning cereal and afternoon coffee. Last but not least are some dried mangoes that my Mom brought back from the Philippines. These are in every Asian market in Chicagoland, so you don’t need to fly to the Philippines to get them. Truth time (even though I did say that this isn’t a confessional): I used to hate these. In fact, when my Mom asked if she should bring some back, I replied, “Nah.” But I found myself craving these, so I brought a bag to work. They were so freaking delicious. Great alternative to gummy bears for anyone who is jonesing for one of those. Furthermore, my co-workers who hadn’t tried them before really liked them. I feel like they’re different enough from real mangoes to stand on their own as a vegan treat. Not pictured but also currently at my desk are nuts, chips (sigh… chips… I can’t quit you), Biscoff spread, and granola bars. If I ever complain about being hungry at work, you have permission to slap me.